Valets in Los Angeles are hijacking public spaces, wrecking cars, using fake signs and hiding tickets from customers -- and we've caught them on tape. NBC4's Ana Garcia spent a year documenting abuses and catching valets as they hijack free parking spaces that you and I are entitled to use. Wait until you see what our camera caught outside some of the city's most exclusive and popular restaurants. City Council President Eric Garcetti thinks valets need more regulation. "They can't reserve those spots. They can't block them off. They can't put a cone there. They can't put a bag over meters," Garcetti said. But they do. NBC4 caught them putting fake Department of Transportation bags over meters and using cones. It's all part of a land-grab for prime parking spots. Valets in Los Angeles are hijacking public spaces, wrecking cars, using fake signs and hiding tickets from customers -- and we've caught them on tape. "Valets do not have the right to public spaces that are not loading zones," Garcetti said. "These valet companies are just using our streets as if they are their parking lots," said Danielle Elliot, a frustrated homeowner who lives in the Fairfax district. She says valets use residential streets to park cars. 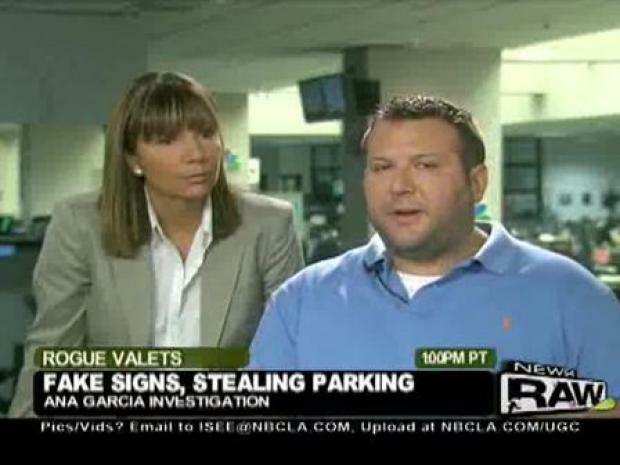 Watch investigator Ana Garcia and Fred M. talk about their investigation into valet companys using fake signs to "hijack" public parking. "Many are parking wherever they can, blocking our driveways so we can't even access the driveways," Elliot said. At the exclusive Ivy restaurant on Robertson Boulevard where celebrities dine, our cameras caught valets from the Pyramid valet company parking multiple cars at expired meters, leaving the cars at risk of getting parking tickets, which they did. Pyramid Parking valet manager Rickson Pessanha told NBC4 that when a car gets a ticket, the company pays for it and then alerts the owner. NBC4 video captured a car parked by a Pyramid employee get a ticket. When the owner arrived, it did not appear that the valet alerted the owner about the ticket. Also at the Ivy, we captured an accident when a valet went to retrieve a parked Cadillac Escalade. It collided with a minivan. Pessanha said the company paid $1,800 to fix the car. Pessanha also denied using customers' cars to shuttle employees. Our hidden cameras showed the opposite. "We saw them repeatedly using customer's high-end cars as shuttles," Garcia said. NBC4 also found cars parked at meters that read "fail." At one meter, a paperclip was jammed in the coin slot. A valet denied putting it there, even though he approached the meter, inspected it and then searched the ground for something. "When we park, the meter was failed," said the valet. "I was not looking for anything. I don't know anything." The Ivy had no comment, but the president of Pyramid Parking told us on the phone that he runs a "professional operation that treats each car as a prized procession." He reiterated that "it's not illegal to park cars on the street" and it's "not their policy to use cars as valet shuttles." He also said staffers "keep plenty of coins" on hand for meters. Perhaps the most outrageous fraud we uncovered was fake parking signs made to look like the kind the city uses. Outside of the Foundry On Melrose Restaurant, we spotted a fake sign screwed onto the meter. The official looking metal sign says "Valet Zone" in red lettering. The problem is that in Los Angeles, there is no such designation as a "Valet Zone." Just around the corner from Melrose Avenue on Poinsettia Place, we found a temporary tow-away sign, thrown on meter where Unisex Valet is working. The city said Los Angeles officials did not put the sign there. "You have to pay me $6," said the Unisex Valet employee. "But I don't have to pay you $6. This is a free spot. This is fake. You're making up the rules. I can park my car here," Garcia said. "C'mon, I can park here. This is crazy you have a fake sign here," Garcia said. "Pay me $6," said the valet. Unisex Valet never responded to the NBC4 investigation. 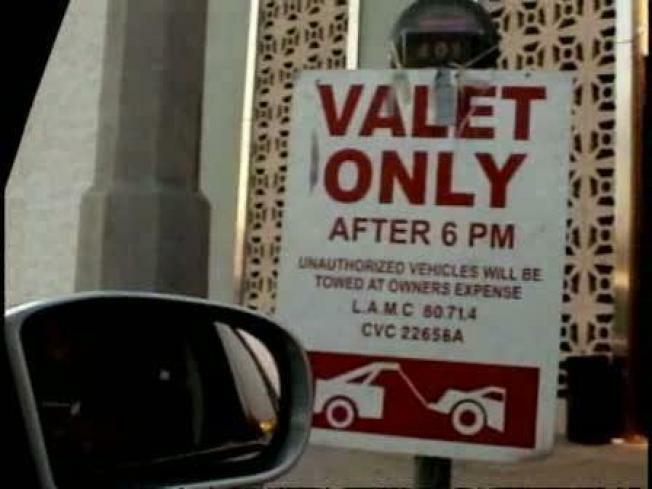 The owner of National Valet Inc., Juan Carlos Huarcaya, admits one of the signs is fake. "So, you just put the sign up everyday and then take it down?" Garcia said. "Yeah we take it down. We need it," Huarcaya said. Huarcaya claims he needs more space for his operation. He showed us copies of letters he says he sent to the city asking for a loading zone. The Foundry's owner and chef, Eric Greenspan, says he didn't know what the valet was doing. "When I was alerted it was a fake sign, I immediately took action. I made sure they took the sign down," Greenspan said. Our investigation uncovered more than 80 loading zones that the city could not account for in its records. Are they all fake signs? No, says the city. Some are stolen from other locations. Dave Wesson, a parking meter supervisor for the Department of Transportation, described the problem as an epidemic. Officials ultimately determined most of the signs we showed them on Melrose Avenue and Third Street near the Beverly Center were illegal and have since removed them. "As a result of our undercover investigation, the city has been taking down these fake signs and freeing up parking spaces for the public to use again," Garcia said. But the victory was short-lived. The next night, the fake signs on Melrose Avenue were back up again. Officials confirmed they didn't put them there. "We are happy to report most of the signs taken down by DoT are still down. DoT is going to replace loading-zone signs from the meters with signs on (elevated) poles to prevent theft and tampering. Also Councilman Garcetti plans to form a citywide taskforce to crack down on stealing of parking space. He also says we need some new city ordinances and state laws," Garcia said.